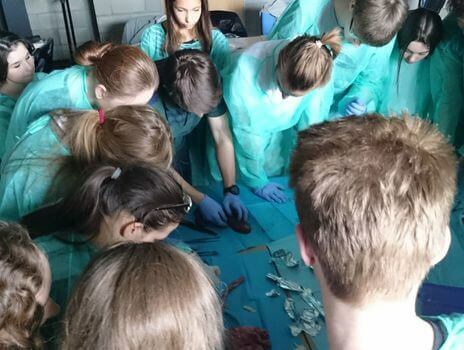 Students from the Lubelskie Voivodship had an unusual opportunity to learn about the behind-the-scenes of the profession of a physician during free-of-charge classes organised within ADAMED SmartUP Academy on 21–22 May this year. They learnt, among others, how to talk to patients and give a diagnosis based on a medical history. A course on first aid in life-threatening emergencies was run as well. During their meetings with the students, the physicians presented, among others, secrets of contemporary medicine, anatomy or neurological examinations. They explained what the physical examination involves and presented the differences between psychiatry and psychology. The students particularly enjoyed the practical part which gave them an opportunity to learn suturing. The form of ADAMED SmartUP Academy meetings gave the youth a chance to talk with the experts and exchange ideas with their peers. The ADAMED SmartUP Academy is a programme of special courses intended for young science enthusiasts. The workshops, designed for young people aged 15-19, are organised regularly in cities across Poland.